I went out today and bought a used mountain bike. 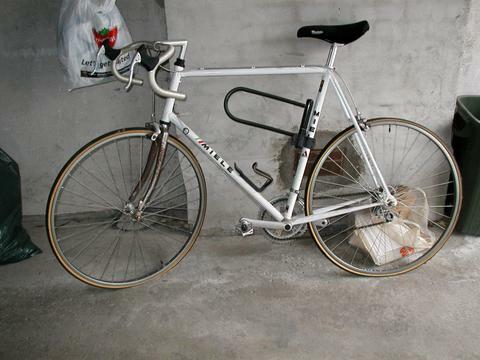 It’s an 18-speed Raleigh (I think), and it’s good for what I want it for — going to a bike with the family. 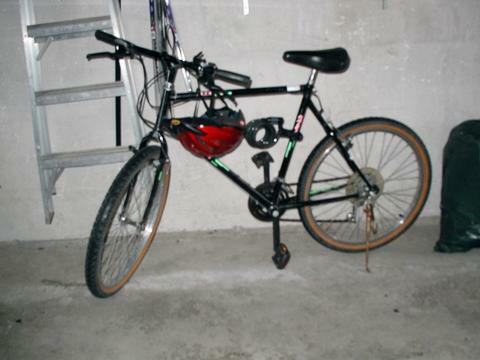 My old bike was more of a speed bike, and frankly I never used it. It’s a Miele and it cost a bit when I got it back around 1990. It’s way light — lighter even than Ronnie’s old, small bike. We’re going to take Ronnie out to look at a new bike this week. He’ll be getting another used bike (it won’t last long at the rate he’s growing). We found this place at Brimley and Progress Ave (northwest corner) that seems like a self-owned, bike shop. It’s short on decor and long on low prices and lots of grease and hardware. Oh, the guy there doesn’t have an interac machine yet (he says it costs $60/month to rent, and about $1,000 to own), so you might want to pay cash. Can’t remember it’s name offhand. I’ll try to post a comment later. There’s a big bike store in Pickering down Brock Rd by Bayly. The prices are good. The name of the store that Reid metions is “Bicycle Warehouse”. Can’t see how their business will improve: nothing but a fold up sign in front of the place, with a garage-type door in front — can’t even see the bikes! But I picked up my bike today, and it seems to be in pretty good condition. I’ve been meaning to go to the bike store Jeff mentions (is it Pedal Performance, 1050 Brock Rd?). I started searching and calling places when my local bike shop (West Hill Cycle) wanted to charge me $90 to replace my breaks and do a tune up on my bike. I couldn’t believe they’d charge me so much, so I shopped around. Almost every place I called was cheaper. I called the stores in Pickering, but this hole in the wall in Scarborough had the best price. There were actually 2 in Pickering. One, Bay Cycle Sports, said they couldn’t get to my bike until May (!!). I may visit Pedal Performance, as I haven’t picked up a bike for Ronnie yet. There was a really nice one, like new, at Bicycle Warehouse, for $100. I was hoping to get one for a little less. I came across your site doing a google search for Miele Bikes. I have the exact Miele, I bot from a racer from Calagary last summer. Would you have the sale booklet for it? I am most interested in this time period. Any information like original cost, parts on bike. original or not would be interested in hearing about. PS The bike rides great, I cycle 80km regularly on it. Ed, I don’t think I still have the original booklet, sorry. I bought it new back around 1990-1991 though. All the parts are original, I haven’t replaced anything. Are you still interested in selling the Miele?